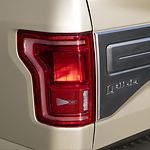 It is no secret that Ford manufactures dependable, high-quality vehicles. But did you know that you don’t have to buy a brand-new model to ensure that it will last? Ford’s Certified Pre-Owned program (CPO) carefully selects eligible vehicles to offer in the resale market. Before a used vehicle qualifies for the program, it must first pass a rigorous 172-point inspection, which includes a careful look at its history, exterior, interior, diagnostics, performance, and more. Technology is the wave of the future. Without it human beings would continue to live primitively. The 2018 Ford Focus ST is a compact performance hatchback vehicle with many technology features that keep drivers will living with the Jetsons. First, the vehicle presents heated leather seats and a leather trimmed steering wheel for prolonged warmth during your driving experience. The Ford F-150 is a pickup truck that tows up to 13,200 lbs. and carries up to 3,270 of payload. Beneath whatever you decide to carry is a full boxed frame constructed from up to 78 percent high-strength steel. The resulting body is almost 700 lbs. lighter than previous versions making for greater fuel efficiency and higher capacity. 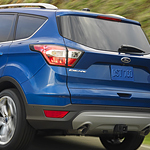 Did you know that the Ford Escape is ranked number two in the nation for compact SUVs? That beats out some luxury models as well. Ford has gone above and beyond with its latest. As a compact SUV, the Escape offers so much more affordability, performance, interior comfort, and safety than many of the other SUVs in the same category. 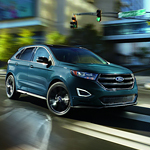 Ford has been working hard on changing its compact SUV offering since last year. The new design is roomier with more tech options and better fuel economy. With its spacious interior and advanced driving technology, the 2018 Ford Edge SUV is a great option for adventurers and families alike. It utilizes a number of unique features to enhance the driving experience and keep you safe on the road. Whether you're driving through slick city streets or the rugged terrain of off-road paths, the Edge is designed to assist you along the way. All-wheel drive models have numerous sensors located throughout the vehicle that work to keep track of the ground around you. It uses this information to balance out the torque between your wheels. The Ford EcoSport is a popular compact SUV that uses many features to make driving easier and more efficient. This SUV is perfect for all driving conditions. The auto start-stop system helps save fuel and reduces emissions. It activates when your foot is on the brake pedal for a set amount of time. The motor will fire backup when you take your foot off the brake and hit the gas. You will stop burning up fuel at train tracks and long red lights. 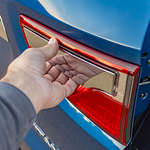 Newer vehicles contain a system that includes sensors contained within each tires. The sensors are linked to technology that measures tire pressure. Tires tend to lose approximately one pound per square inch of pressure each month. This is normal. However, extreme temperature changes cost a greater pressure loss. Many myths have circulated over the years about when you should get your car's motor oil changed. Many are handed down to us from the early days of automotive maintenance. One of these enduring myths is that you should always have your car's motor oil changed before taking it on a long road trip. Motor Oil, Transmission Fluid, and Coolant - Oh My! We, as humans, must have fluids in our bodies at all times in order to function. As a matter of fact, roughly three-fourths of our overall mass is – you guessed it – water. Vehicles are constantly in need of fluid as well. Although they are inanimate objects, they require fluids to keep them functioning as normal. Let's detail two of the most popular fluids that every modern vehicle needs to work. Transmission fluid helps switch gears, in both automatic and manual versions of vehicles.